Ray Reynolds, the last Decorating Manager at Shelley Potteries was born in King Street, Fenton in 1924, some 500 yards from the Shelley factory. 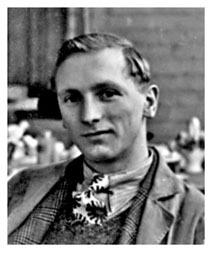 Ray obtained a scholarship to the Burslem School of Art during the Gordon Forsyth era. In 1940 he started his career at Royal Doulton training under Eric Webster, later moving to Crown Staffordshire. Ray joined Shelley Potteries in 1949, initially as Assistant Decorating Manager and then as Decorating Manager. He was one of two senior managers at the company when it was taken over in 1966. Ray continued to work at the old Shelley factory until 1973. Management in those days was very much "hands on", everything to do with the decorating department, including firing, was dealt with by the manager. Ray observed how the company went out of its way to respond to "matching" requests, and how he personally maintained the consistency of "pink trousseau" for the Edward Walker Company of New York. Ray stated that the Shelley family showed loyalty to their workers and that often several members of the same family worked for the company. Ray's boyhood neighbour, Irene Birks, said "she looked forward to work every day". Irene worked for Shelley all her life, visiting stores around the country demonstrating pottery painting. Along with John Evans, an apprentice designer of note, she demonstrated pottery painting at The Festival of Britain in 1951. Ray recalls employees more vividly than customers, but remembers that the Duke and Duchess of Windsor were customers, as was the Earl of Shrewsbury. Ray was a much esteemed Honorary President of The Shelley Group and retained his skills and enthusiasm for Shelley pottery, decorating some special, unique pieces for the Group, to the end.